2011 December | Blue Boat Foods, LLC. Aquaponics, Organic, Local, Dirty Dozen? Blue Boat Foods, LLC is a start-up business located near Newburyport Massachusetts. Blue Boat Foods (inspired by Peter Mayer’s song Blue Boat Home), will be selling local organic fruit and vegetables all year round to Natural Food stores in Massachusetts like Whole Foods Market and Trader Joe’s that are within a 100 mile radius (a.k.a “The 100-Mile Diet”). Blue Boat Foods will distinguish itself from other businesses by using Aquaponics and renewable energy sources to sustainably grow organic fruits and vegetables. Moreover we’re going to initially limit our product line and directly target six of the “2011 Dirty Dozen” fruits and vegetables. The 2011 Dirty Dozen is a list of foods with the highest pesticide residue. These are the foods that are most concerning for customers who are seeking local organic and trying to eat the 100-mile diet. Blue Boat Foods will be able to uniquely supply the “local organic” demand in New England all year round by initially targeting The 2011 Dirty Dozen. * Products Blue Boat Foods will provide in Phase 1. Blue Boat Foods is going to be doing what no other company has been able to or even attempted to do before. We will be growing local organic fruit and vegetables 12 months a year in New England using only Aquaponics and renewable energy sources because New Englander’s don’t just want local organic a few months out of the year, they want local organic all year round. Just because we get devastating Nor’easters doesn’t meant we have to eat roots all winter long. 12 Month Growing Season In New England? Problem Solved! Blue Boat Foods will operate in a Net Zero capacity and utilize special techniques to maintain perfect indoor environmental conditions in greenhouses designed specifically for New England winter conditions, while reducing operational costs to virtually zero. The special techniques Blue Boat Foods will utilize include solar PV panels, vertical wind turbines, geo-thermal and passive solar heating to power the whole aquaponics system. A large grid-tied battery array will provide constant regulated power and web enabled software will automatically adjust pump throughput, water temperature, and monitor all critical environmental factors. If any environmental variables are outside of peak operational ranges, all Blue Boat Foods members will be alerted via SMS text message and email and will be able to remotely manage the system via a secure website. Our high-tech and sustainable approach with a Net Zero footprint will maximize growing potential while virtually eliminating risk and operational costs and allowing Blue Boat Foods to boast being ultra sustainable and environmentally friendly. Furthermore targeting six of the Dirty Dozen fruits and vegetables will ensure that we can maximize profit, especially in the off-season. It’s a Win-Win-Win for our customers, the environment and us. Blue Boat Foods will take at least 20% of the profit and reinvest back into the business. Within a 100-mile radius of the Company’s location, there are zero competitors and at least 67 resellers of Natural Foods indicating a strong ability to capitalize on this new market trend without competition, especially in the off-season when the demand is highest and the supply is nonexistent. Blue Boat Foods will primarily use Aquaponics to further increase our production. Aquaponics is a combination of Aquaculture and Hydroponics. Each of those systems has problems when used separately, however when used in conjunction with each other, they both solve the problems that the other system has. It’s remarkable actually. Aquaponics (pronounced: /ˈækwəˈpɒnɨks/) is a sustainable food production system that combines a traditional aquaculture (raising aquatic animals such as fish, crayfish or prawns in tanks) with hydroponics (cultivating plants in water) in a symbiotic environment. In the aquaculture, effluents accumulate in the water, increasing toxicity for the fish. This water is led to a hydroponic system where the by-products from the aquaculture are filtered out by the plants as vital nutrients, after which the cleansed water is recirculated back to the animals. 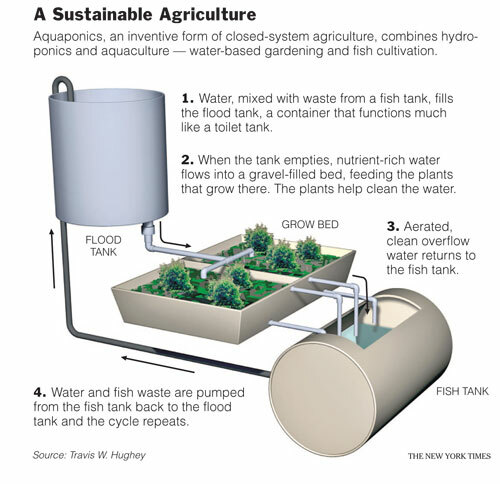 The term aquaponics is a portmanteau of the terms aquaculture and hydroponic. Conservation through constant water reuse and recycling. Organic fertilization of plants with natural fish emulsion. The elimination of solid waste disposal from intensive aquaculture. The reduction of needed cropland to produce crops. The overall reduction of the environmental footprint of crop production. Building small efficient commercial installations near markets reduces food miles. Reduction of pathogens that often plague aquaculture production systems. Initial expenses for housing, tank, plumbing, pumps, and grow beds. The infinite number of ways in which a system can be configured lends itself to equally varying results, conflicting research, and successes or failures. Some aquaponic installations rely heavily on man-made energy, technological solutions, and environmental control to achieve recirculation and water/ambient temperatures. However, if a system is designed with energy conservation in mind, using alternative energy and a reduced number of pumps by letting the water flow downwards as much as possible, it can be highly energy efficient. While careful design can minimize the risk, aquaponics systems can have multiple ‘single points of failure’ where problems such as an electrical failure or a pipe blockage can lead to a complete loss of fish stock. Like all aquaculture based systems, stock feed usually consists of fish meal derived from lower value species. Ongoing depletion of wild fish stocks makes this practice unsustainable. Organic fish feeds may prove to be a viable alternative that negates this concern. Other alternatives include growing duckweed with an aquaponics system that feeds the same fish grown on the system, excess worms grown from vermiculture composting, as well as growing black soldier fly larvae to feed to the fish using composting grub growers. The only input to an Aquaponic system is fish food for the fish and electricity for the electrical systems. Duckweed is a perfect natural food for Tilapia and is a very fast growing self-replicating or asexually reproducing plant. Duckweed in combination with organic fish feeds yields the highest growth rate. The electrical needs will be supplied by the combination of a Solar PV Panel array and the vertical wind turbines. The electrical heating system will ultimately be a back-up system to the primary heating system. The primary heating system will be a combination of geo-thermal (constant 55 degrees F), passive radiant solar (greenhouse effect from specially designed winterized greenhouses) solar water heaters and compost water heaters. Conventional electrical heaters connected to the solar and wind powered battery array can be used as a backup heating system to ensure constant optimal atmospheric air and water temperatures for the entire aquaponic system. Again all vital systems will be constantly monitored and any deviation from optimal operational ranges will result in an alert via SMS text message and email to all Blue Boat Foods members. Each member will have access to a limited access web portal where the entire Aquaponic system can be managed. If the problem cannot be resolved remotely for some reason, someone going onsite can resolve it quickly. To increase awareness of its business, Blue Boat Foods intends to launch a creative promotional campaign. Marketing channels will include the use of a public facing website with the best in class Search Engine Optimization (SEO), limited direct print media advertisements, hosting of a grand opening event, word of mouth referrals and Internet advertising channels via Google AdWords. Through these efforts Blue Boat Foods will establish its reputation as a trusted provider of local organic fruits and vegetables that attempt to cut the Dirty Dozen in half and supply the needs of people who are participating in the 100-mile diet. Adam Scarcella will own and operate the Company. Adam earned a B.A. in Physics from Wheaton College in Norton, MA in 1997 and a Master of Management: Concentration in E-Commerce (MMEC) from Cambridge College in Cambridge, MA in 2003. Adam has worked in several different industries including Software, High-Tech Manufacturing & Reselling, Construction and Customer Service. Adam has been employed with Percussion Software, Inc. since November 2004 as their Senior Software Support Engineer III (Tier 3). Adam has a unique mix of skills including Business Administration, Management, Software Development, Construction, Physics and Chemistry. Adam also is personally motivated to solve the local organic food problem. Adam and family eat as much organic fruit and vegetables as possible. The problem is that there really aren’t any local organic choices in New England in the off-season between September and April. That’s 8 months were Blue Boat Foods can fill the gap for this market demand. Peter Mayer’s song Blue Boat Home reminds me just how beautiful and magnificent Mother Earth really is. That’s why I started Blue Boat Foods, because I wanted to grow food the way Mother Earth intended. Aquaponics is as close to a natural growing process as you can get and once the system is online, the natural growing process takes over. The only inputs to the system are fish food and power. The fish food will be fast growing and self-replicating duckweed, and all the power will come from multiple renewable energy sources. It’s virtually self sustaining, dare I say a perpetual motion machine. Aquaponics breaks the barrier of seasonal growing and allows growers to produce products 12 months a year as long as the environmental conditions are balanced.